Andraez “Greedy” Williams was a superstar at the collegiate level and is ready to take that stardom to the next level. Williams played for the Southeastern Conference powerhouse, Louisiana State University. At LSU, Williams emerged as one of the best coverage cornerbacks in the country. The nickname, “Greedy” is more than fitting. He racked up the pass deflections and interceptions during his tenure with the Tigers. After a successful college run, many believe that Williams could be even more successful at the NFL level. But where does he stand on the draft board, and will the Ravens pick him? If someone asked me what was it that he/she needed to know about Greedy Williams, I would say that they need to know that Williams is dominant in coverage. Williams’ value as a coverage cornerback cannot be understated. Greedy Williams locks on to receivers, and rarely ever lets them go. He has the speed to keep up with some of the fastest receivers in the game, the height to match up with them, and the awareness to know when he needs to make a move. In the Southeastern Conference, Williams was paired up with some of the best receivers in the game. He went toe to toe with the likes of Riley Ridley but never allowed either to dominate. Even D.K. Metcalf, who is objectively faster and stronger was not able to shake Williams in their matchup. What is most intriguing about Williams is that not only is he fantastic in coverage, but he is a turnover machine. Williams watches the opposing quarterback’s eyes while he simultaneously closely follows his receiver. This gives him a crucial awareness of where the ball is at all times, and with this awareness, he is able to deflect and intercept passes. In his two years at LSU, he deflected 19 passes and intercepted 8. While watching his sophomore tape, I noticed that quarterbacks tended to refrain from testing Williams. This was obviously by design, as Williams recorded six of his eight interceptions in his freshman year. But even with limited action, Williams continued to lock down receivers, and make crucial plays. Where Williams struggles most is an out of coverage function. Greedy Williams makes some good tackles but lacks consistency. He often fails to wrap up the ball carrier, and sometimes completely misses a tackle. There is no doubt in my mind that Greedy Williams will be a liability in run support where he will need tackling consistent tackling skills. He may get away with a sloppy technique in college, but it will be exposed at the professional level. There are also concerns about Williams’ weight. At 185 lbs, Williams could be pushed around by NFL receivers. There is no evidence on the tape I watched of this happening, but it could appear when paired up with much stronger receivers in the NFL. Finally, Williams almost always loses coverage when a wide receiver makes a quick stop or hesitates. This is especially apparent when he tries to cover curl routes. Williams usually stays too far behind his receivers and loses them when they reverse their direction. This is not the worst flaw to possess, but it could be a problem down the road. Greedy Williams is a prospect with tremendous upside, but the potential to be a bust. I think that Greedy Williams will be a fantastic coverage cornerback in the NFL, but needs to improve on his tackling technique. If the right NFL coaching staff gets ahold of him, he will be a star. I don’t think his weaknesses are enough to warrant him a potential bust labeling, but they are concerning enough. They must be addressed as soon as possible in the NFL. Grade: 7.9/10.0 – Late first round pick. Should the Ravens Draft Greedy Williams? No, the Baltimore Ravens should not draft Greedy Williams. It is becoming clearer and clearer by the day that the Ravens will continue with Jimmy Smith in the defensive backs room. 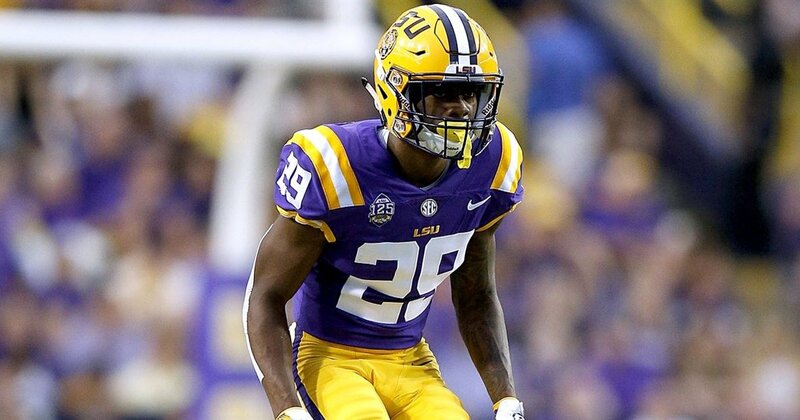 Greedy Williams would be a solid addition to any team, but the Ravens are overstocked at cornerback. Marlon Humphrey, Brandon Carr, Jimmy Smith, Anthony Averett, and Maurice Canady are all expected to be back in 2019. Humphrey, Carr, and Smith are all starting-caliber cornerbacks and could be the number one cornerback for almost any team in the NFL. Williams would need to fight tooth and nail for playing time. When drafting in the first round, a team should always look for an immediate starter, not a rotational player. With other pressing needs, the Ravens should refrain from drafting Greedy Williams.